I can’t lie, I love paints… I have loads of them by many different manufacturers and have recently been swept up by the buzz over the new range of Scale 75 paints. At the moment I am painting a lot of non-metallic miniatures and have an age-old recipe from Arkaal that I have been using for around 10 years, but I am finding that the Vallejo paints that I use tend to split when I add a lot of water to it. So I have been on the look out for a possible alternative. So, I ordered the NMM Steel set but also got seduced by the metallic steel set 😉 It could make for a nice comparison. My first impressions are pretty good – the paints dry VERY flat, something I’ve not see since the old Rackham paints, but with a much finer texture. Scale 75 paints all come in 17mm dropper bottles (like Vallejo), which is a preference of mine, so its nice and easy to drop paint onto your palette or into the reservoir of your airbrush. The first thing I noticed when I took them out of the box was that there was no separation in the bottle – it was an even colour from the top to the bottom. I then spent a while trying to get paint from the pot onto my pallet… I failed because there is no hole in the top of the nozzle… don’t make the same mistake, be ready with a pin! They also seem to take a good amount of water without splitting, which is very handy for the techniques I typically use. I have yet to try the metallics, but the bust of Uncle John is just screaming out for a true metallic finish to his bionic eye! 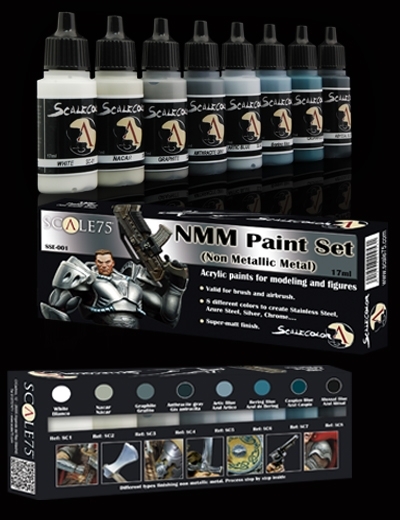 The NMM set consists of 8 paints, which are really split into two groups, a neutral grey and a blue-grey plus a very dark blue-grey* and a white for a universal shade and final highlights. *I can see myself using this colour quite a lot, as I think it will make a great shade colour for many warm colours, and flesh tones. 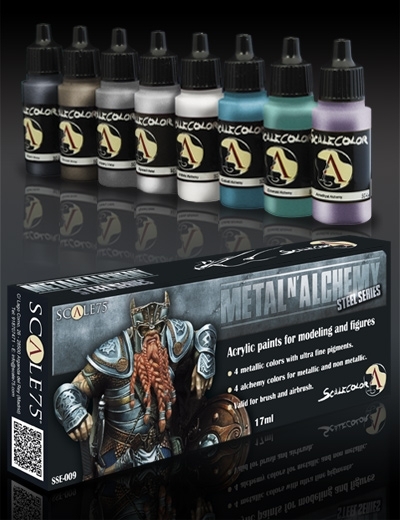 The metallic paint set is also 8 colours – 4 steely metallics from dark-light, and 4 metallic effects paints which includes some interesting coloured metals and a very bright silver metallic perfect for spot highlights when painting metallics in an NMM style. I noticed these on the MDP stand at a Figure World last month. I have always been a huge Vallejo fan as a military modeller so I have a huge stock of dark greens, dark greys and more shades of beige than you can shake a brush at. However, now I do figures, I needed some real colours and went for a few sets of Scale75. I just love them to the point of thinking that my current stock of Vallejo will not really be re stocked. By the way, well done on spotting the sealed droppers on the bottles. I read one review where the reviewer was annoyed that ‘every bottle was blocked’………. ‘Every bottle was blocked’ lol… it took me a while to realise what the issue was, but as soon as I had checked three bottles it became more obviously a design feature. Must admit I have not used them in an airbrush yet. I have been told that the Scale75 thin OK for airbrushing with water. Being thicker than Vallejo, it’s just a case of getting the viscosity right. I really do like the matt finish though, Vallejo look quit satin at the side of them. Might have to get the Flesh set as I struggle with flesh. Thing is with these sets is to not only see them as a project in a box but as stand alone colours in their own right, which of course is what they are. I thought exactly the same think. In fact I was looking for a rack but couldn’t decide how many I will eventually have. Now, however, I will be keeping them in their boxes to enable me to find the right colour to go with the ‘instructions’. An example of using them for different ideas, I have the Sky and Ice blue set which I used to paint a blue dungarees top on a bust. Even though I am a novice at painting figures, it worked out well due to the richness of the colours. For airbrushing, I have found they work well – need thinning like most colours not specifically designed for air though. One thing I did find is that they don’t work with Vallejo thinner. Ended up clogging my H&S Infinity Silverline pretty bad, meaning a full clean was required. I ended up buying the Scale colour thinner and it worked perfectly, I think Tamyia thinner also works fine with it (easier to come by in the UK too). Good shout on the scale colour thinner… I’ll check that out. I’ve not been using the Vallejo thinner to thin my paints, I’ve actually been using the vallejo airbrush cleaner… I’ll see how that reacts with the Scale 75 paints and report back!